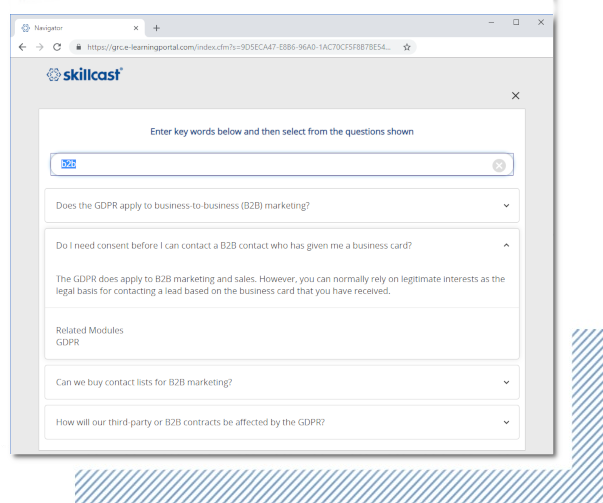 The Skillcast LMS helps companies manage the complexity and reduce the cost of regulatory compliance by delivering mandatory and optional training, CPD, instructor-led training, a policy hub, attestations, compliance registers and much more on a single, managed platform. The Skillcast LMS is a fully featured learning management system for building and delivering all your digital training content. It provides one-click access to e-learning courses, robust reporting, complete tailoring and branding, and options for HR data integration, single sign-on and more. The Skillcast LMS comes as a fully managed software-as-a-service (SaaS) with an exceptional level of customer service that far surpasses anything you will experience with other e-learning vendors. You'll be pleasantly surprised by how smoothly and efficiently you can run your training programmes with our expertise. We assign a dedicated Service Manager from our Global Client Service (GCS) team to each client as your single, permanent point of contact. 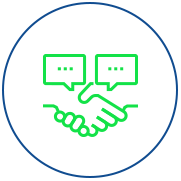 Your Service Manager will act as your trusted partner in ensuring the success of your learning and strategic communication initiatives. MI reports are essential for managing your compliance programme effectively, and evidencing the training to internal and external auditors and regulators. 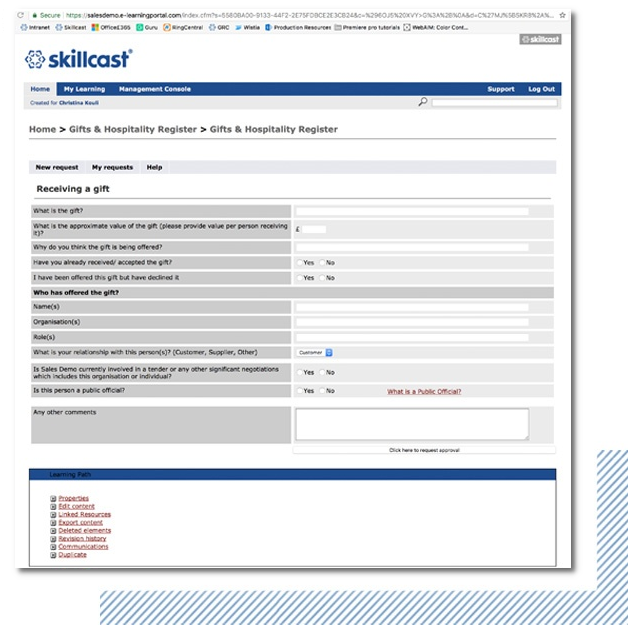 Since Skillcast is designed specifically for compliance training, it provides every type of report that you might need to fulfil both of these objectives. Each employee sees a clean, personalised user interface (UI) with one-click access to their learning assignments for an in intuitive, accessible user experience (UX). 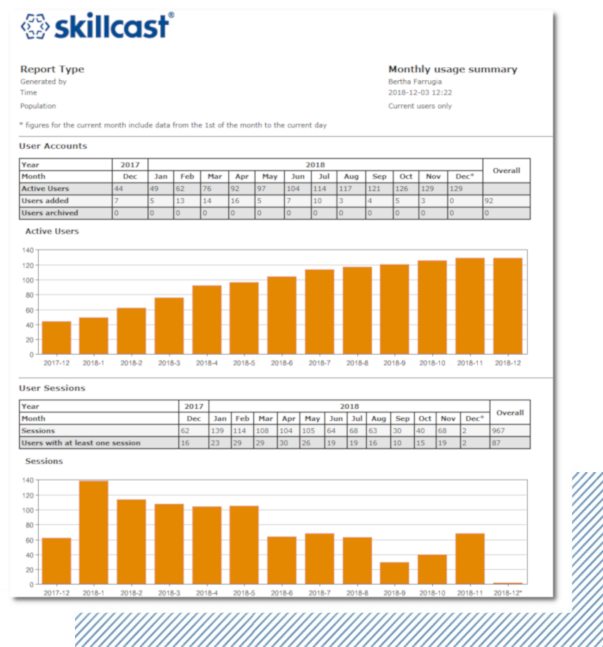 The Skillcast LMS provides unparalleled support for compliance training initiatives, with robust tracking, bookmarking, comprehensive MI reporting, on-boarding of new starters via data feeds and automated email chase-ups. Compliance managers can assign learning content on an ad-hoc basis or as an annual training plan based on job roles. Alongside the LMS, Skillcast offers the widest selection of compliance e-learning courses in the UK. These offer a quick and cost-effective route for covering your compliance training needs. All the courses will be automatically branded with your corporate look and feel, and you can make further edits very easily and at no cost. Administrators can start blogs, moderated discussion forums and surveys. Employees can bookmark and rate content, interact in discussion forums and contribute content. The Skillcast LMS fully supports SCORM 1.2, SCORM 2004 and AICC e-learning standards for delivering all bespoke or third-party courses that also comply with these standards. It also supports Remote AICC for Content as a Service (CaaS). You can roll out sophisticated competency assessments, including SSBA (structured scenario-based assessments), and fully customise the implementation with pass marks, maximum attempts, time limits, cooling-off periods and re-certification on a periodic basis. Your Service Manager can create predefined reports by using one of the dozens of best-practice report templates or ad-hoc filters that you request. These reports can be assigned to managers or compliance officers for one-click instant access to all the information that they need. The diagnostic reporting functionality of the Skillcast LMS goes far beyond the usual MI reporting found in other LMSs. You can access the competency map of your whole organisation, and drill down to departments and individuals to identify and deal with any knowledge gaps. Employees can see full records of their learning journey and download/print completion certificates with unique IDs for their personal records. The Skillcast LMS supports scores of languages. Administrators can set a default language preference based on location, but employees can change the language preference at any time too. Any language that is not already supported can be added on demand. Your Service Manager can help you create multiple domains in your LMS installation, with different branding and permissions for various subsidiaries, joint-venture partners or other entities that you wish to share your content with. The Skillcast LMS can be extended with add-ons for instructor-led training, continuing professional development (CPD) tracking, policy hub and various RegTech tools, such as gifts and hospitality register and DSE assessment. 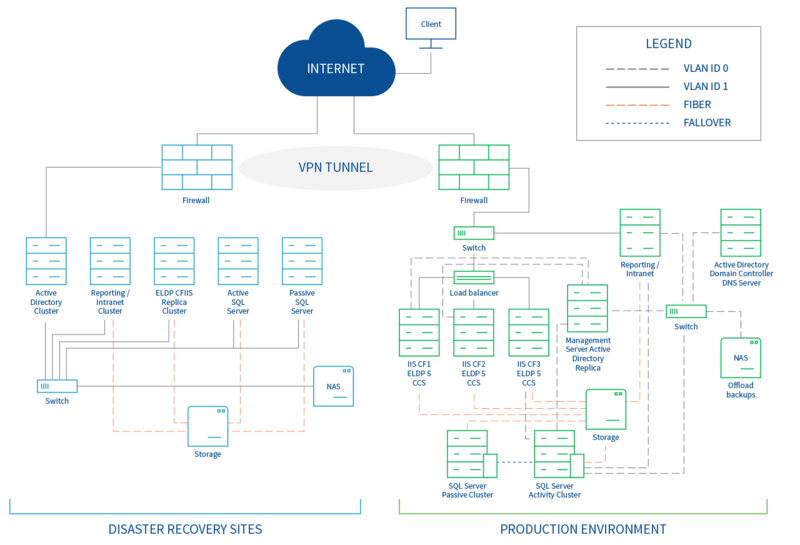 Our technology infrastructure is designed to be fault-tolerant, with multiple/redundant processors, storage, connectivity and even power supplies. For instance, if there were a power outage or internet failure on one line, our systems would instantaneously switch over to a redundant line to provide you with an uninterrupted service. 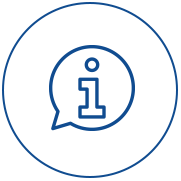 The Skillcast servers are located at highly secure facilities in London and Newbury, which feature multiple layers of security and protection from fire, earthquakes etc. Online access security is provided by Cisco firewalls. We maintain a remote Disaster Recovery Site (DRS), where all the data from our primary datacenter is being mirrored in real time. The DRS effectively has the same infrastructure as the primary datacenter, so, in the case of a calamity at the primary datacenter, the DRS can ensure the continuity of our services. Our Information Security Management System (ISMS) is paramount to our ability to serve our clients. All our process and datacenters comply with the ISO 27001, which is the gold standard for an ISMS. It includes standards for security policies, organisational security, asset classification and control, personnel security, physical and environmental security, systems and network security, access controls, systems development and maintenance, business continuity management and compliance. Achieving this certification demonstrates our commitment to ensuring the safety, security and integrity of our clients' vital information, which goes beyond the requirements of the EU General Data Protection Directive. Create an audit trail of all gifts and hospitality given and received by employees across your organisation with this add-on to the Skillcast LMS. 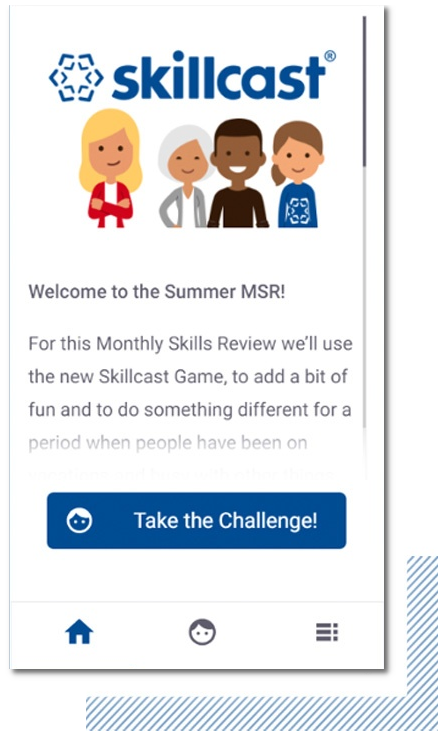 Since the GHR is an add-on to the Skillcast LMS, it can be deployed practically instantaneously. It is managed by your dedicated service manager, and fully customised to match your policies, organisational structure, and escalation and compliance procedures exactly. It gives employees easy access to enter requests to give or receive gifts and hospitality. These can be auto-approved based on the parameters you have provided, or escalated to the relevant manager to approve or reject. The GHR provides an audit trail of all gifts and hospitality given and received by employees across your organisation. It can also flag up potential issues, such as multiple gifts or hospitality items given to a single recipient, and any unusual or suspicious patterns of activity. 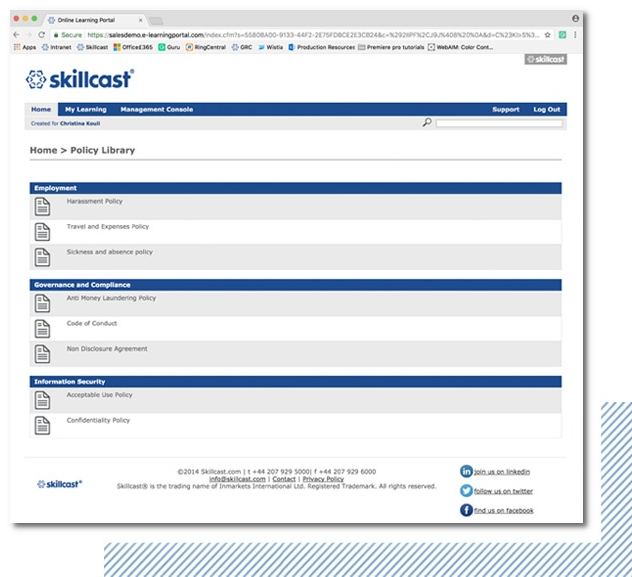 Add a Policy Hub to your Skillcast LMS to manage, deliver and obtain affirmations to all your critical policies from your employees. 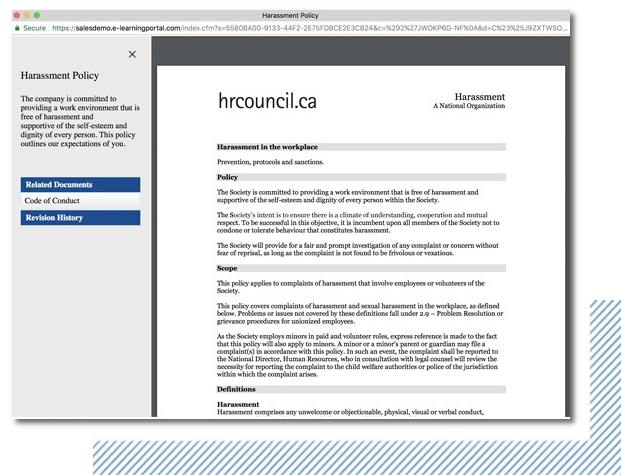 The Policy Management Console allows you to add or edit policies by simply uploading the document. There is an option to upload different language versions as well. You can optionally require your staff to complete an attestation for the policies. The Policy Hub leverages the functionality of the fully managed Skillcast LMS, including up-to-date employee data, assignments, communications and chase-up, MI reporting and administration by your dedicated Service Manager. 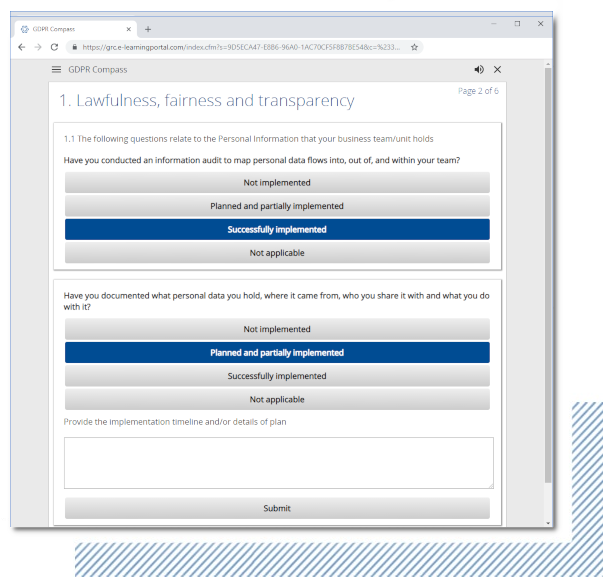 Administrators can generate one-click reports of the policies that employees have read and attested to, and analyse the data at global, departmental and individual levels. 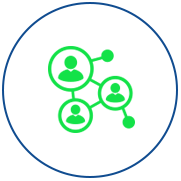 Team managers can be set up with reports that show which team members have not completed their training or failed to attest to the required policies. Cut down on the costs and logistics of DSE appraisals with the DSE Assessment add-on to your Skillcast LMS. All employers in the UK have a legal obligation to provide DSE training and assessment for all employees who use computers regularly at work. This training and assessment is also important for the wellbeing of your employees, as the incorrect use of DSE can result in musculoskeletal disorders and repetitive strain injuries. Skillcast offers an effective online solution for your staff to conduct these assessments themselves. 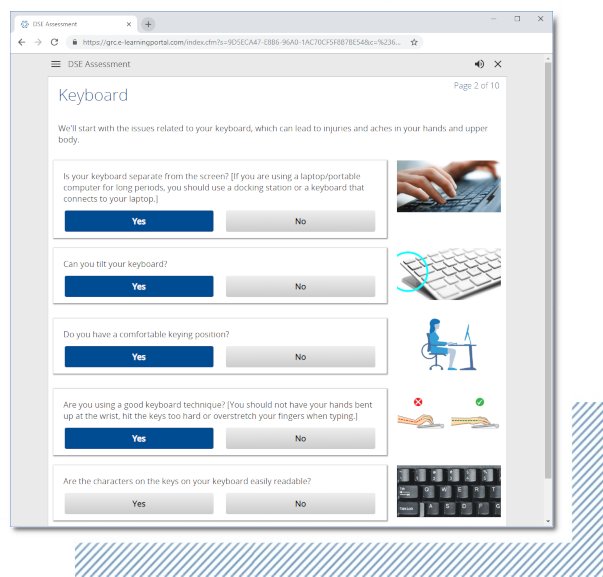 As the DSE Assessment Tool is an add-on to our LMS, you can combine it with digital training on DSE and ask your employees to attest that they understand the correct use of their DSE workstation before they use the DSE Assessment Tool. The tool then alerts the relevant manager to any issues that your employees have reported, and enables them to review, comment and close the issues after resolving them. Thus, you can provide DSE training and assessment to your employees on a more timely basis and avoid the logistics of scheduling DSE assessments. You can also identify issues that are being flagged up by multiple employees and take proactive action to prevent them from becoming more widespread. 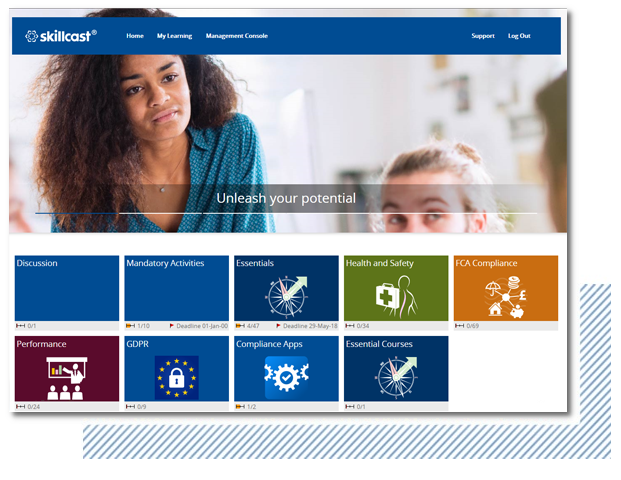 Assess your organisation's compliance readiness on everything from the GDPR to BCM with the Compliance Compass add-on to your Skillcast LMS. The Compass is a Skillcast LMS add-on that helps you to survey your front-line managers, key decision makers and customer-facing staff to map your organisation's readiness on key compliance issues such as Business Continuity Management (BCM), data protection and financial crime. This add-on enables you to select and assign front-line managers and other key staff individually or based on rules, and ask them to rate and comment on critical measures that you have implemented concerning the compliance issue that you are testing. With this, it builds a snapshot of your overall readiness, and uncovers critical risks and gaps that you need to address. 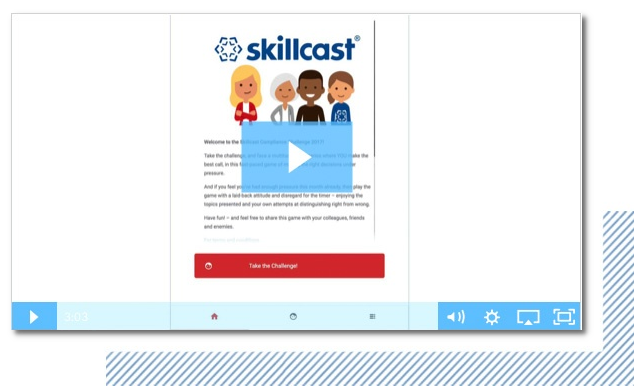 This just-in-time learning add-on to the Skillcast LMS provides practical answers to your employees' questions and promotes further learning. 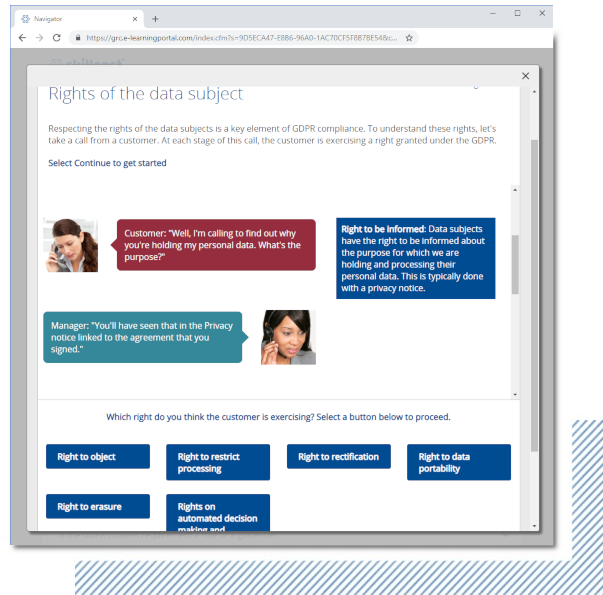 Support your employees in making the right decisions concerning personal data by providing them with the Compliance Navigator. This is a just-in-time learning app with short answers to hundreds of questions and links to further learning. Employees can ask any question in relation to a chosen topic and immediately receive the exact answer. The answers can be fully customised to your business so that they reference your policies, procedures and controls. They can also feature links to more in-depth digital training that you have sourced from Skillcast or other providers. Reinforce your staff training with serious games, which can be delivered and tracked on any SCORM-compatible LMS like any e-learning module. Catch the attention of your employees with a gamified approach to create awareness of key risks and build a culture of compliance in your organisation. Help your employees to remember what they've learned in their training by using their knowledge repeatedly in a fun competition. Separate assessments from training, and conduct them days, weeks or months later to get a better sense of the long-term impact of the training. Assess compliance risks across your organisation by department, manager or area, and then deliver only targeted, relevant content. Our Mobile Card Game is a scenarios-based game where your employees are presented with simple propositions in a realistic context, which they can accept or reject with a single click or swipe. It's a fun way to reinforce the training that they receive. This game has been designed using mobile-first principles. Although it will engage users on all devices, including laptops and desktops, the layout and navigation are optimised to deliver the best experience on smartphones.